If you’re trying to lose weight or improve your diet, you should probably eat more fish. The American Heart Association recommends that you eat at least two servings of fish each week. But fish calories vary substantially and some that are higher in calories provide healthy fat. So the type of fish you choose makes a big difference. There are some types of fish to avoid and other types of fish that are better. Comparing fish calories can be tricky because the way you prepare your fish can change the nutrition facts significantly. But you can compare raw fish calories with this guide based on USDA nutrition data. Fish calories and nutrition are listed for a 100 gram (3.5-ounce) serving. Halibut (raw with skin): 116 calories, 3 grams fat, 0 grams carbohydrate, 20 grams protein. Tuna (yellowfin, fresh, raw): 109 calories, less than one gram fat, 0 grams carbohydrate, 24 grams protein. Cod (Atlantic, raw): 82 calories, 0.7 grams fat, 0 grams carbohydrate, 18 grams protein. Mahimahi (raw): 85 calories, 0.7 grams fat, 0 grams carbohydrate, 18.5 grams protein. Ocean perch (Atlantic, raw): 79 calories, 1.4 grams fat, 0 grams carbohydrate, 15 grams protein. 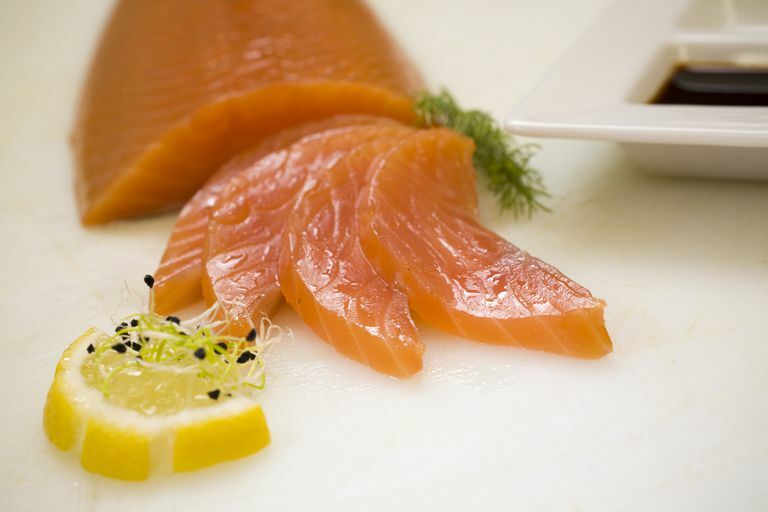 Believe it or not, the best fish for weight loss and improved health is fatty fish. But not just any fatty fish. Certain types of fish contain an essential fatty acid called omega-3. This polyunsaturated fat provides your body with important health benefits. Fish that contain omega-3 fats help to reduce your risk of heart disease. According to the National Institutes of Health, studies show that people who eat seafood at least once per week are less likely to die of heart disease. Researchers also believe that the omega-3 fatty acids found in fish may help to reduce symptoms of rheumatoid arthritis and may even help to improve brain and eye health. Of course, you can get essential omega-3 fatty acids by taking a supplement. But research has not been able to show that taking a supplement can provide the same benefits as eating omega-3 foods, like fish. So if you're going to build a diet-friendly weight loss meal, why not choose a fish that provides a boost of good health as well? Eating higher fat fish may mean that you consume more calories in a single meal, but if you eat the fish in moderation and use good cooking methods to prepare the food, you may benefit in the long run. The American Heart Association suggests that you eat fish varieties such as salmon, mackerel, herring, lake trout, sardines and albacore tuna to get your healthy dose of omega-3. The calorie counts listed are for the raw form of each omega-3-rich fish. Note that unless cooked with flour or another ingredient that contains carbohydrate, fish itself, as a protein, does not contain any carbohydrate. The way that you prepare your fish will change the calorie count. Baked fish, grilled fish, and broiled fish are usually lowest in calories. And what about shellfish and other types of seafood? A single serving of shrimp (three ounces) provides about 100 calories and only 1.5 grams of fat, so they can be a healthy addition to your diet. And calories in scallops are low as well. Three ounces of steamed scallops provide about 95 calories and less than one gram of fat. Even though eating fish can be good for you, not all fish is good for your diet. There are some times when skipping fish is the better diet choice, even if the fish is high in omega-3 fatty acids. When fish is battered and fried it is usually full of saturated fat. These are fats that you should limit in your diet. Convenience products like breaded fish sticks, fish tenders, and fish patties are often higher in fat and calories and don't provide as many health benefits as fish that is prepared using low-calorie methods. For example, a breaded fish fillet provides approximately 350-400 calories and 17-25 grams of fat and up to 5 grams of sugar. When you're trying to cut calories in a restaurant, be wary of fish dishes that can ruin your diet. It's usually best to skip the fish and chips and choose a grilled or roasted fish instead. Ask for the sauce to be put on the side to keep the fat and calorie count in control. Fish experts suggest that you buy the freshest catch available. It helps if you know what questions to ask when you visit the fish counter at your local market. When was it caught? The fresher the better. Fish may remain edible for five days after it is caught, but it may not taste as fresh. How was it stored? The way that the fish is stored and delivered to the market will have an impact on the taste. Fish should be chilled immediately after catching, and kept cold through delivery and to the market. How does it look? How does it smell? If the fish has a bad odor, it is probably not fresh. Fresh fish should smell like seawater. If you are buying fish fillets, look for a moist texture with clean cut edges. If the fish is whole, look for clear eyes and firm texture. Where is it from? The Natural Resources Defense Council suggests that you buy local fish from sustainable fisheries. In their Smart Seafood Buying Guide they advise that you buy American fish and provide a list of fish with lower mercury levels for better health and safety. What is the best way to prepare this fish? Sometimes, the fish monger is the best source for fabulous, simple and healthy fish recipes and preparation methods. Use your fresh fish within two days or put it in the freezer. When you are ready to use frozen fish, thaw it in the refrigerator (never at room temperature). If you're not used it, including fish in your diet might be hard at first. But the health benefits of eating omega-3 fish are clear. And when you're trying to lose weight, it's important to choose foods that are nutrient-dense. That means that they are foods that provide many nutritional benefits for fewer calories. If you don't like the taste of fish, there are a few things you can do to include it in your diet. First, try less "fishy" varieties. For example, many healthy eaters say that red snapper (about 100 calories per serving) has a less fishy taste than a heavier fish like salmon. You can also add fresh herbs and citrus to manage the taste. Or try adding fish to recipes that you know you like. Add fish to a healthy salad. Or try making healthy fish tacos. You can add salmon to your morning omelet or even make a lean fish sandwich for lunch. You can use fish just like you would use any other diet-friendly protein, like chicken. Drizzle your fish with lemon or lime to give it a fresh and zesty flare. If you're creative and persistent, you'll get your two servings of fish per week along with all of the health and weight loss benefits that they provide. James J. DiNicolantonio, PharmD; James H. O’Keefe, MD; Carl J. Lavie, MD. "The Big Ones That Got Away: Omega-3 Meta-analysis Flawed by Excluding the Biggest Fish Oil Trials." Journal of the American Medical Association October 8, 2012. Evangelos C. Rizos, MD, Ph.D.; Evangelia E. Ntzani, MD, Ph.D.; Eftychia Bika, MD; Michael S. Kostapanos, MD; Moses S. Elisaf, MD, Ph.D., FASA, FRSH. "Association Between Omega-3 Fatty Acid Supplementation and Risk of Major Cardiovascular Disease Events A Systematic Review and Meta-analysis." Journal of the American Medical Association September 12, 2012.